Launching worldwide in October 2018 to coincide with the “Suede 50” program, the collection fuses KARL LAGERFELD’s iconic aesthetic with PUMA’s street style classics. PARIS, FRANCE (September 3rd, 2018) – KARL LAGERFELD is pleased to announce it will collaborate with PUMA for the first time ever, to introduce a capsule collection for men and women. Marking 50 years since their iconic sneaker’s first launch, PUMA’s “Suede 50” program throughout 2018 culminates in the highly-anticipated release of the KARL LAGERFELD X PUMA collection. It will launch worldwide on October 19, 2018 three days following the official 50th anniversary of the original Suede Classic release. The KARL LAGERFELD X PUMA collection features two unisex Suede sneakers inspired by KARL LAGERFELD’s iconic signature aesthetic – a tuxedo jacket, high white collar, tie and sunglasses. The shoes blend Karl’s timeless look with contemporary streetwear style, and feature either a playful KARL graphic or removable sunglasses detail. 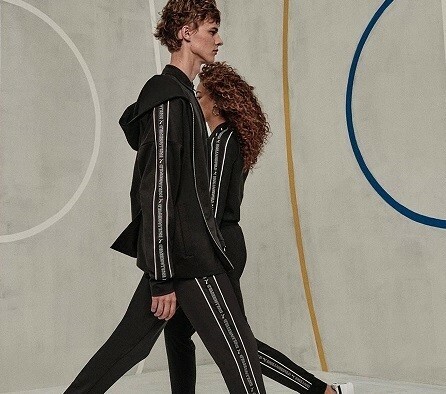 The women’s offering includes a tuxedo-inspired T7 track jacket with matching pants and a T7 Jumpsuit, both are stylish plays on PUMA’s iconic Track Jacket with 7mm stripes, a Track Top, and a cropped Tee. The men’s collection features a slim-fit Hoodie and matching Sweat Pants, plus a logo Tee. The clothing styles is further complemented by a backpack, a shoulder bag and a baseball cap featuring custom KARL LAGERFELD X PUMA branding. Prices will range from €40 to €175. The KARL LAGERFELD X PUMA collection will be available for pre-sale at www.KARL.COM and www.puma.com on October 18th, 2018 and worldwide on October 19, 2018 at KARL LAGERFELD and PUMA retail stores, online at KARL.COM and puma.com, and via curated retailers and concept stores.